The HoM awards went to Peter Shields and Nick Pearce, and Tracey Greenway. Congratulations to them. They will receive technical running gear from HoM sponsor UP & RUNNING. A packed AGM, with the Committee reporting another successful year for Ilkley Harriers, and a shiny new Committee elected for the year ahead ... more on the Committee Page. Excellent race to be recommended. Ralph Tench reports ... Another excellent Ilkley Triathlon organised by Leeds and Bradford Triathlon Club. A fantastic community event which started at 10am in rain and travelled through the full weather system to end in late summer sunshine. Over 350 original entrants (273 finishers) to this increasingly popular event on the local sporting calendar. It�s a triathlon which also attracts athletes from well outside the region as well as many of the British Triathlon development group (youths) which has produced the likes of Philip Graves (course record holder) and of course the 2012 Olympic hopefuls and World Champs, the Brownlees (Alistair and Jonathan). I managed first Harrier home in 9th place in 1 hour 11 seconds. Yes the 11 seconds hurt as it was my worst swim by a distance for several years � I blame the water - and prevented me going under the hour. Collected first local male prize for the sixth year and third Vet 40. Loads of friendly faces out performing and supporting during the day. Also great to see many family teams and family rivalries (Websdales, Elliots etc). The most well represented family generationally probably goes to the Hayes family (Sarah and John - both Harriers � Peter (brother), Spike (dad aged 73) and brother in law. Plus Daniel (12) handing out the drinks on the finishing line. 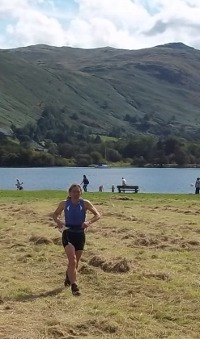 On Saturday Georgia Malir ran in an England vest for the first time at The Commonwealth Mountain And Ultra Distance Championships in Llanberis North Wales. 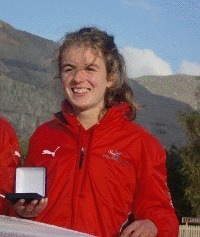 Georgia ran in the U16 England team in The Home Countries Championship Mountain Race. The race was of 6.31km and was an up and down course of 315m ascent. Georgia was 5th placed girl and 2nd England counter, the England U16 team of three runners won UKA champs gold medals. Pete Shields reports ... Nick Pearce and I visited our last 25th Harriers Anniversary challenge today, Scafell Pike, the biggest climb in England. Scafell Pike in the Western Lake District is one of the truly great classic fell/mountain races - 4.5 miles in distance with 3000ft of climb. We were very ably supported by Morgan Williams, an athlete not adverse to a challenge himself, and finished in great style both top in our age groups. Nick, who is really on top of his game at the moment finished in 19th position giving him the first V55 prize. Peter, very ably supported by Morgan who finished a place in front of him, finished as first V60 in a quality field. This race concludes the challenge we set ourselves, inspired by the Club's 25th anniversary and some philosophical words spoken by Morgan to me earlier in the year, which charged the events. We ran the Snowdon Mountain Race, 10 miles in July; then cycled from Lands End to John O Groats unsupported, camping rough, carrying all our own gear, a distance of 1,020 miles in 12 days 22hrs during August and September; cycled back down to Fort William and ran the Ben Nevis Mountain Race, technically the hardest race on the calender a distance of 10 miles; the conclusion being today's race of 4.5 miles. Throughout the challenge we have literally flown the flag for Ilkley, the club's pennant. Whereever we have been it has been flown on the back of my bike, the result being numerous conversations in many dialects up and down the country about Ilkey Harriers. The challenge was a way of showing our appreciation to the club, which we have both been members of for numerous years. People have asked if there was some charitable motive behind what we have done, this was never the case but if there is strong enough feeling we would be happy to put our achievements to a cause. With a total of 1230 miles, would a penny a mile be to much to ask if that was the case? Ewan Welsh reports ... ventured up to Langdale on Sat for the Great Langdale ½ marathon, the route takes the runners in an anti clockwise direction from Great Langdale to Little Langdale through Skelwith bridge, turn off up the back road to Grasmere then turn off to the left and run next to a tarn (the name escapes), then up a few more hills and down to Chapel Style through Dungeon Ghyll to the finish back in Langdale. A few Harriers were there, I ran 1.44, Elaine about 1.58 I think, and Jean about 2.14 if I recall correctly, I don�t have the results yet (will post then when available), usually only a handful of runners get under the 1.30 for this one. I did experience a free post race plunge in an ice bucket and subsequent massage, the ice bucket brings a tear tae yer eye. Couldn�t recommend the race enough, it�s like a bastion of a by-gone era of road races, not sure I would recommend the ice bucket, it�s a personal choice that one ! The full marathon is also on offer, 2 glorious laps with the same start time. Eric Morley reports ... three members ran this AS race just outside Burnley. The number of competitors this year dropped down to 61, 2010 saw more than double that run. On a fine Saturday morning all aquitted themselves well and finished as follows. Henry Heavisides reports ... I'm not sure that it was the most sensible thing to run two races within 20 minutes of each other, but along with Mark Iley, I'd entered both the 1500m & the 5000m expecting them to be spaced further apart. We did the 1500m first in torrential rain. Mark finished 5th in 5:12 & I was 6th in 5:18 we both got medals for being 1st in our age groups (I was the only M55 taking part!). The 5000m which started less that 15 minutes after the 1500m finished was run in bright sunshine. Out of a field of 22 runners, Mark was 11th in 18:44 & I was 12th in 19:00. This time we were both second in our age groups. 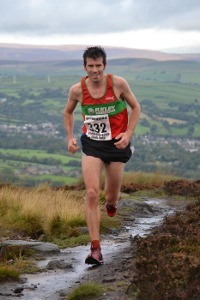 The Harriers running in this event organised by Abbey Runners had to choose 'trail or fell', both races starting and finishing together: Tom Adams picked the fell option and beat all comers. CONGRATULATIONS to World Champion Tracey Greenway, winner of the F45 class at the World Masters Mountain Running Championships - Paluzza, Italy. See the results. Mark Mon-Williams reports ... four harriers braved the flooded roads of the Lake District to take part in the Three Shires fell race. A quick IH meeting before the race established a cunning plan - Dave Wilby would bring glory and honour to Ilkley Harriers by racing at the sharp end whilst Kelly Harrison, Mark and Rebecca Mon-Williams would have a nice day in the hills. The plan went perfectly with Dave running out of his skin in a quality field to take 7th place, only a few minutes down on the first three places. This is a great achievement in a prestigious race. And the rest of us had a lovely day in the hills that was both educational and enjoyable - at least two of us learned that torrential rain in the Lake District requires shoes with some grip. It was a real pleasure after the race to get a tasty pasty and see Dave get his well earned prize. Roy Ruddle reports ... some fine results from the Ilkley contingent. Fairly poor weather but good visibility, and just as well the race didn't take place the next day (gusts of 90mph forecast!). Bad weather routes were used, which made part of the second half of the classic course less exposed but had little impact on its overall length. From Helene Whitaker the Haines family dominated the Ilkley results in this year's Lake District Mountain Trial held in very wet and windy weather in Mungrisedale. Hector came second to Tom Brunt, by a mere 3 minutes trotting around the shortened (but still 15+miles of bog and heather) in 3.44. The ladies of Family Haines, not to be outdone, netted some prizes too. Sarah was 11th lady nipping home in 3.53, a mere minute ahead of daughter Chloe who also bagged the prize for second lady under 21. Peter had to settle for 7th male in the Medium in 3.29, but took home the prize for 2nd male Vet 50 in that class. Excellent food made up for a very soggy day out on the fells! Steve Weston reports the Para's 10 at Catterick is on an undulating 10 mile course that the parachute regiment uses for its selection process (although they do it in boots with a bergen!). There was a minute's silence for the tenth anniversary of 9/11 and the race set off with a shot from some field artillery! A stiff wind made for interesting going on the more exposed parts of the course but some decent times were put in nonetheless, including an amazing run by Alex to finish just outside the top three. Still no Harriers crazy enough for the P company challenge. Ken Souyave reports ... part off road farm track but overall a good course with a few small climbs through pleasant countryside. Well organised with ample parking adjacent to the race course. Strong wind on the day but some shelter by tree lined roads/tracks. Climb up to the village of Kirk Deighton around 5K sees hardest part of course over leaving a fast finish particularly over the last 2 K. My chip time time shows at 40 06 in results but my watch showed a little more so will take chip time!! First vet 60. Winner Paul Lockwood 32 45. So overall suggest this could be a good course for PB if weather conditions good on day. There's a lot going on in Junior Harriers ... the latest news is that the Club has its first Junior Home International runner ... U17 Georgia Malir has been selected to run for the England Fell team at the Junior Home Internationals in Wales. Well done to Geoff Howard for organising the best ever Ilkley incline, on its 10th Anniversary. Thanks to the many Harriers who helped on the night, in cold and wet conditions. A good turnout of Harriers amongst the record field, with Ilkley winning the men's and women's team prizes. Tom Adams won in 7:51, with Ilkley wining men's team and ladies team prizes. Results and photos are on the Incline page. The Junior Sprint Relays attracted 15 teams on a very wet night, results and photos here. David Green reports ... Eddie Irving was first V50 and 9th overall in 37 minutes, David Green 126th in 52 minutes. "Nice race, 250 runners, flattish, good for a first 10k". This was a IH Race League event. Alison Weston reports lovely clear day in the end for a tough event. A mile swim in Ullswater, a 38 mile cycle including the 'struggle' pass and a run up and down Helvellyn. - don't bring the wrong wetsuit home!! I have come to an early conclusion that triathlons and me don't go too well together but it was good fun and I did eventually get round in 5hrs39 mins.